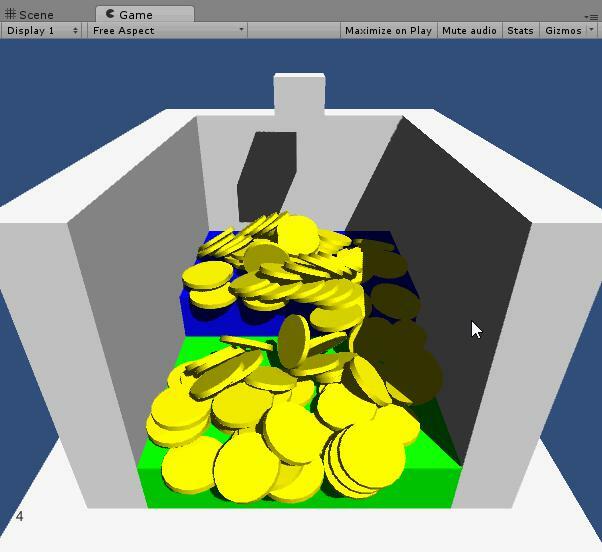 This time, I will explain how to make simple game like coin pusher using Arbor. If you have not already seen the basic section, please read the basic section first. This tutorial is created in the following environment. Depending on the version, please understand that there are parts different from the explanation. First of all, please create a project for the tutorial. For information on creating projects and importing Arbor, please refer to “Getting Started: Preparation for using Arbor”. This time, there are packages in which objects used in this tutorial are arranged in advance, please import here. For details on how to import asset packages, see the Unity official manual “Asset Packages”. First of all, there are scenes in which objects are arranged in advance, please open here. Double-click the Tutorial03 scene in Tutorial03/Scenes/ to open it. 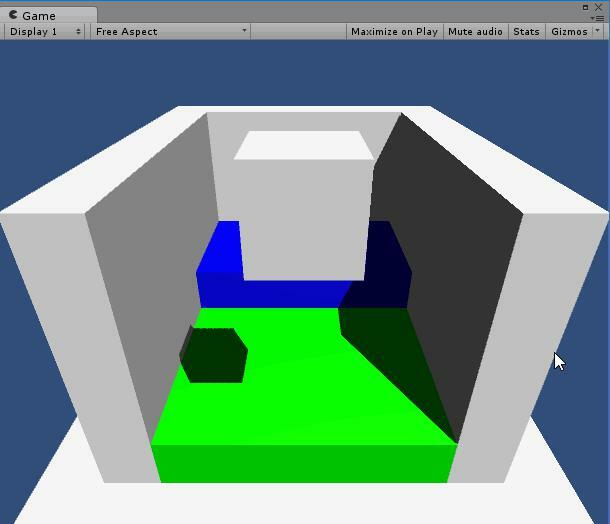 The scene where the object was placed opened, but since it has not set any behavior even if playing starts as it is, it does not hold as a game. Let’s begin by moving the Pusher object to push and drop the coin. 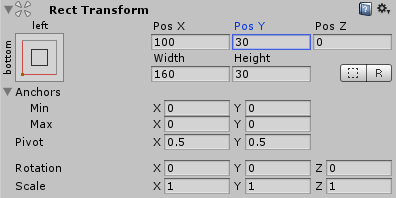 Select the Pusher object from Hierarchy and add ArborFSM from the “Add Component” button in the Inspector window. Open the Arbor Editor window from the “Open Editor” button of the ArborFSM you added. Next, create a Movement state to move. This time, we will move it using TweenRigidbodyPosition. 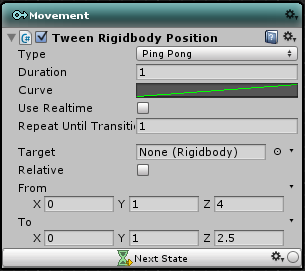 For more information on TweenRigidbodyPosition, see Arbor Reference “TweenRigidbodyPosition”. Please add “Tween> TweenRigidbodyPosition” from Add Behaviour of Movement state. We will set TweenRigidbodyPosition so that it moves repeatedly back and forth. The items to change are as follows. You can see that the Pusher object goes back and forth when executed. 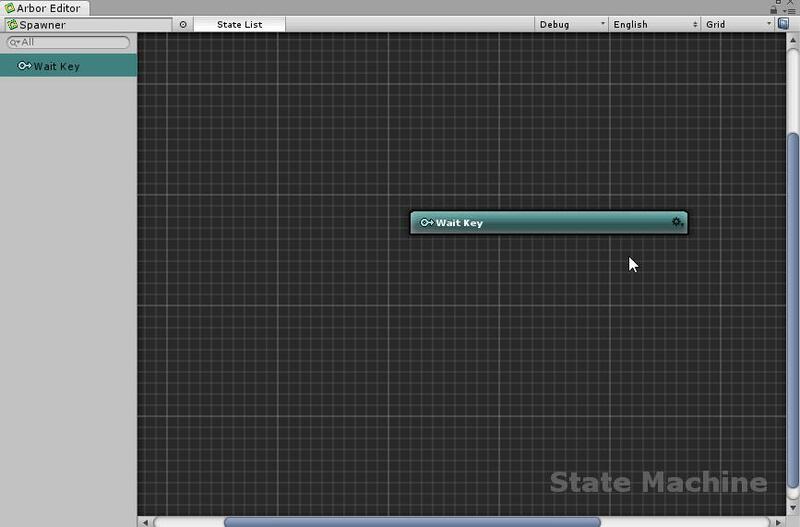 Next, create a process to instantiate a coin by pressing the Space key. 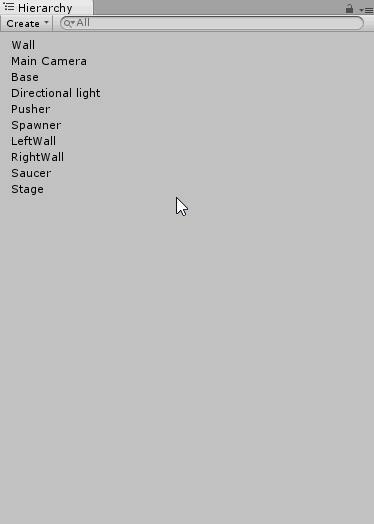 Select the Spawner object from Hierarchy and add ArborFSM from the “Add Component” button in the Inspector window. Create Wait Key state to wait until space key is pressed. 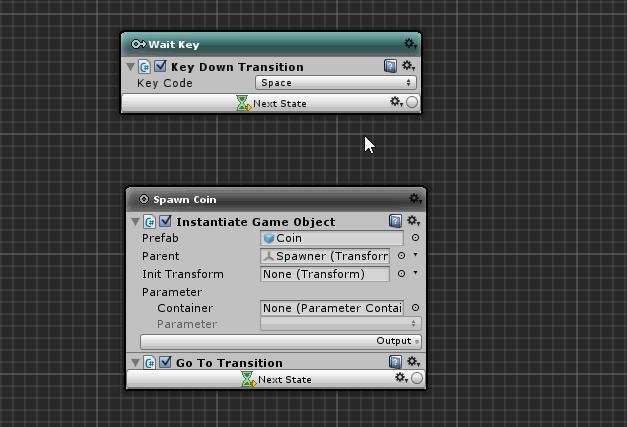 In this time, we will use KeyDownTransition to make transition when key is pressed. For more information on KeyDownTransition, see Arbor reference “KeyDownTransition”. 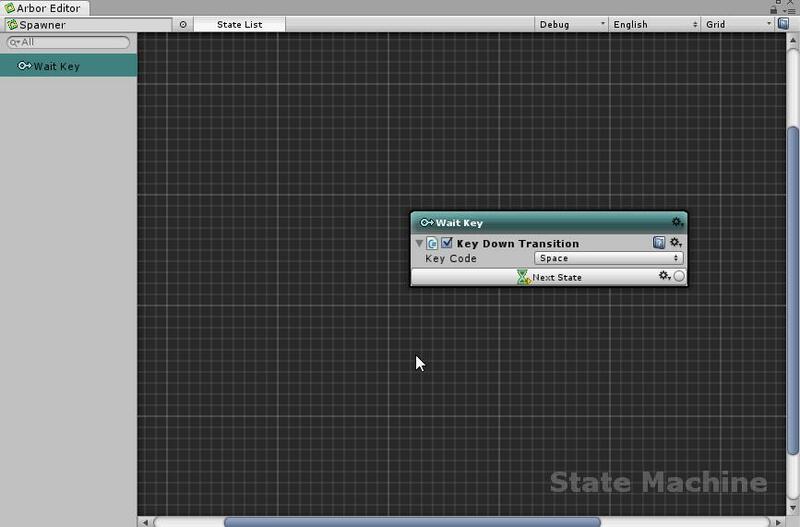 Add “Transition> Input> KeyDownTransition” from Add Behaviour of Wait Key state. Set KeyDownTransition to transition with spacebar. “Next State” has not yet another state, so set it later. Next, create a Spawn Coin state that instantiates coins. 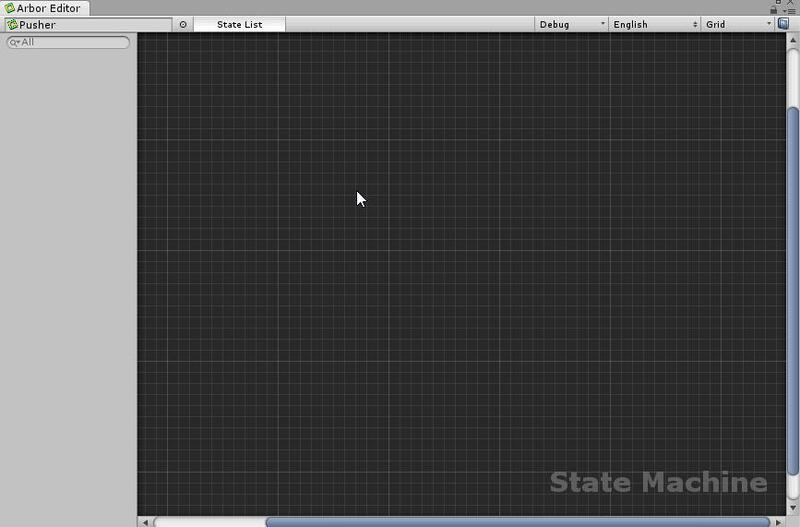 We use InstantiateGameObject to instantiate objects. 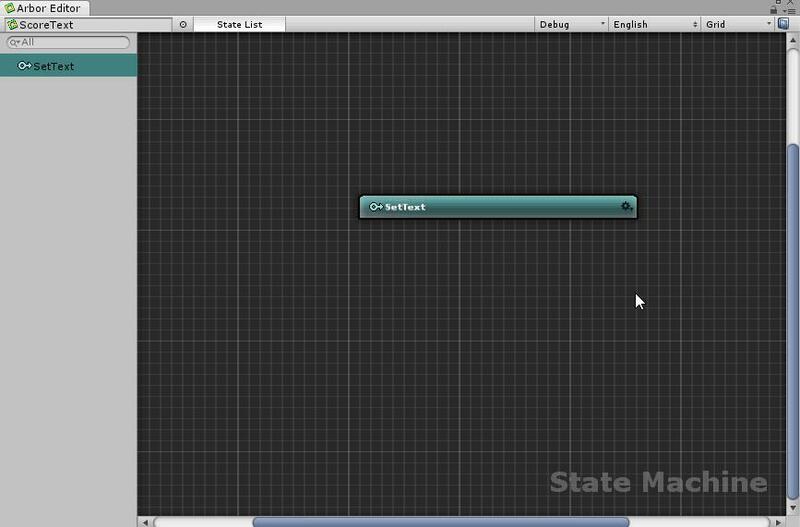 For more information on InstantiateGameObject, see Arbor Reference “InstantiateGameObject”. 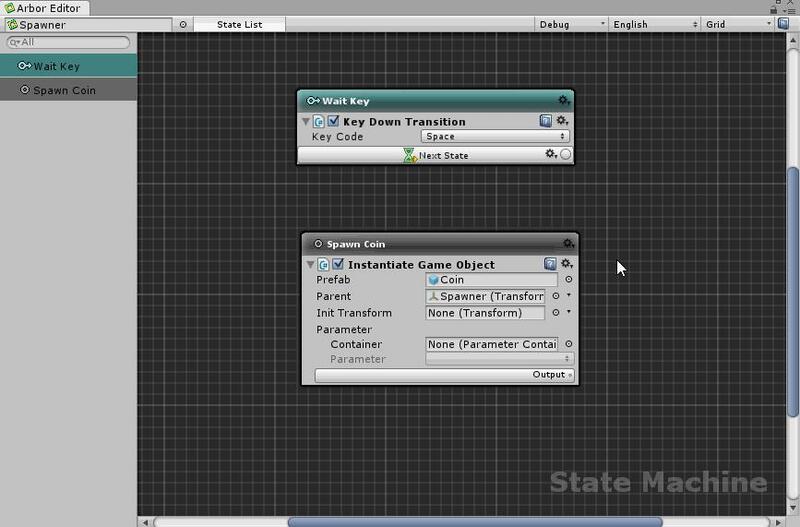 Add “GameObject> InstantiateGameObject” from Add Behaviour of Spawn Coin state. 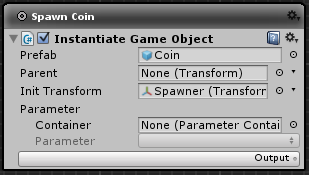 Set it to instantiate a Coin object prepared as a Prefab. When coin generation is done, use GoToTransition to return to Wait Key state. For more information on GoToTransition, see Arbor Reference “GoToTransition”. Add “Transition> GoToTransition” from Add Behaviour of Spawn Coin state. Finally, set it to transit the wait key state and the spawn coin state. 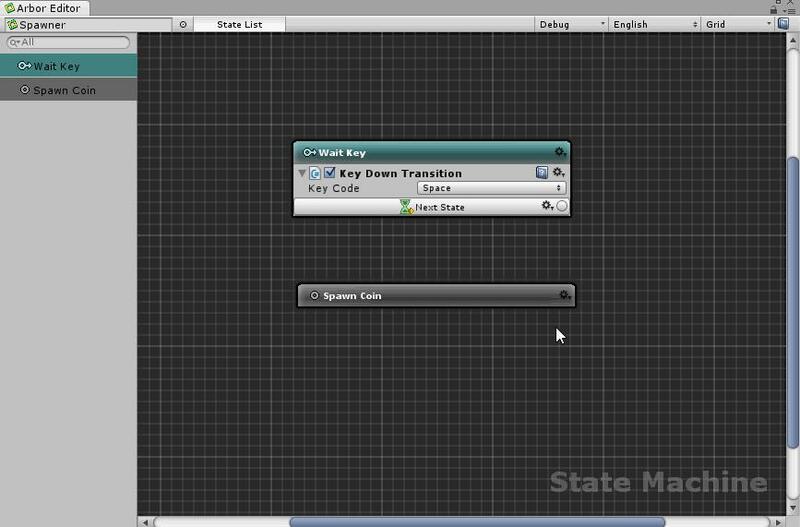 Connect from the “Next State” in the KeyDownTransition in the Wait Key state to the Spawn Coin state, from “Next State” in the GoToTransition in the Spawn Coin state to the Wait Key state respectively. You can see coins are instantiated from the Spawner object each time you press the Space key. Next, I will create a process when the coin falls. 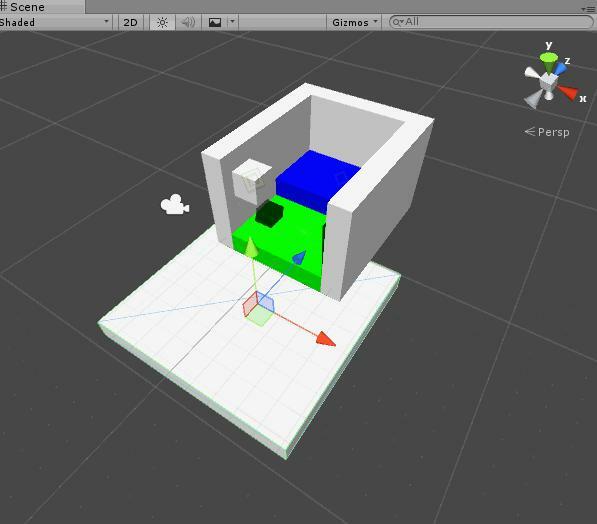 Select the Saucer object from Hierarchy and add ArborFSM from the “Add Component” button in the Inspector window. Then, when OnTriggerEnter comes, I will create a state for processing. 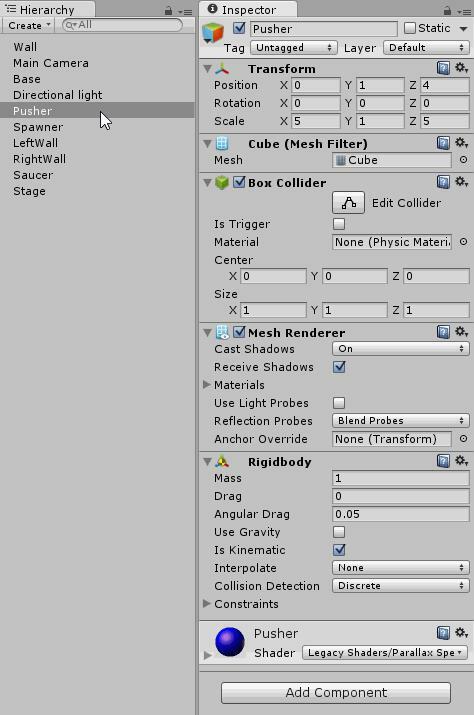 For details on OnTriggerEnter, refer to the “Triggers” section of the Unity manual “Colliders”. Please create a state named “Wait Trigger”. Add OnTriggerEnterTransition to Wait Trigger state. OnTriggerEnterTransition is the behavior of transitioning state when OnTriggerEnter is called. For details, see Arbor Reference “OnTriggerEnterTransition”. Let’s add “Transition> Collision> OnTriggerEnterTransition” from Add Behaviour in Wait Trigger state. Since it is only the coin to judge the contact, setting Is Check Tag and Tag is unnecessary. 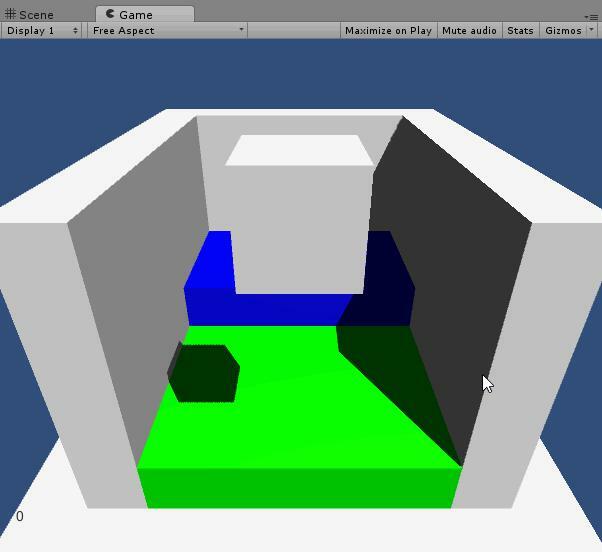 In this example, we will extract the GameObject from the Collider slot via the Calculator node and create the action to destroy. 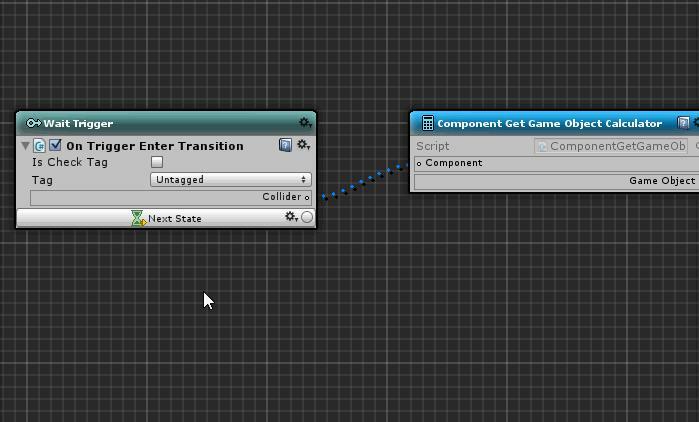 First, use the Component.GetGameObject Calculator node to get a GameObject from a component such as Collider. 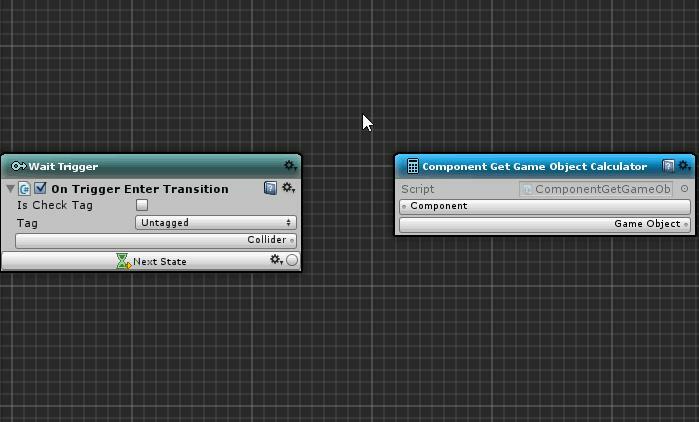 For Component.GetGameObject, see the Arbor reference “Component.GetGameObject”. 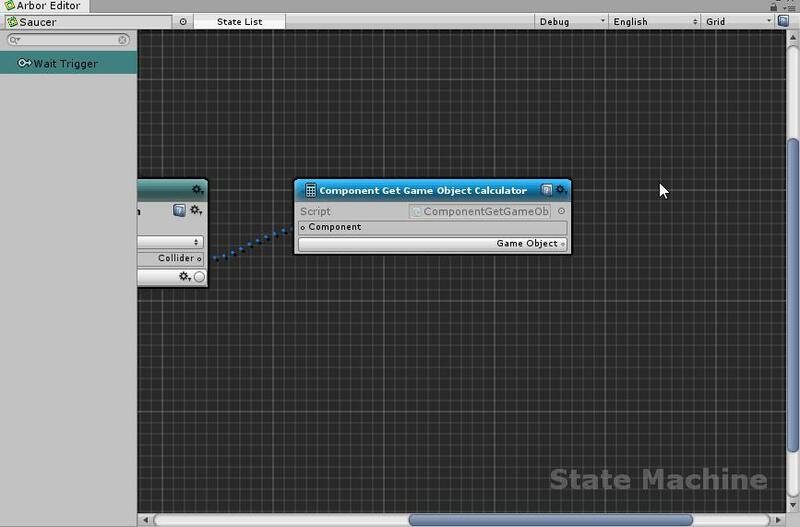 From the right-click menu, select “Component> Component.GetGameObject” from “Create Calculator” to create the Component.GetGameObject operation node. 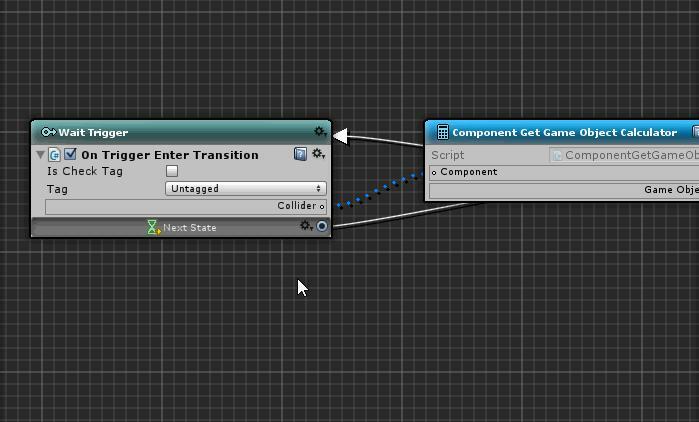 Connect from the Collider slot of OnTriggerEnterTransition to the Component slot of Component.GetGameObject. 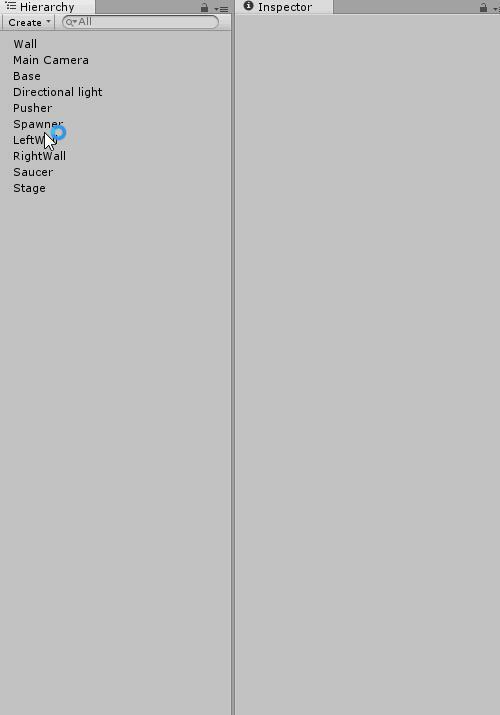 Create a state for processing by Trigger Enter. Please create a state named “Trigger Enter”. 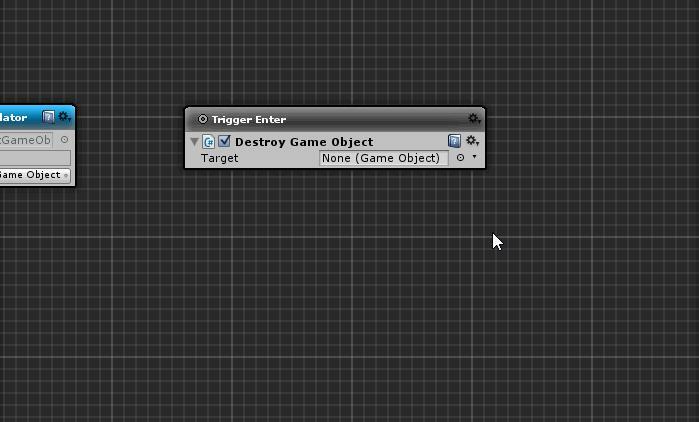 In the Trigger Enter state, add DestroyGameObject to Destroy the Coin object. DestroyGameObject is a behavior to delete the specified GameObject. For details, refer to Arbor reference “DestroyGameObject”. 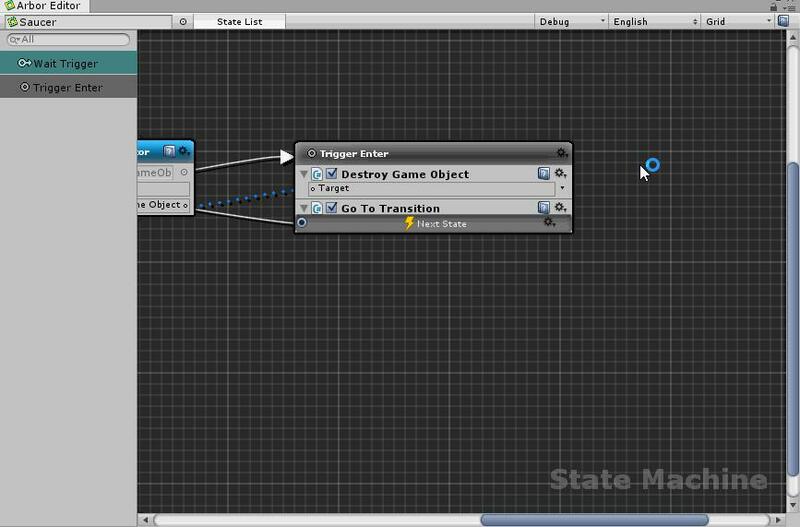 Now add “GameObject> DestroyGameObject” from Add Behaviour in the Trigger Enter state. 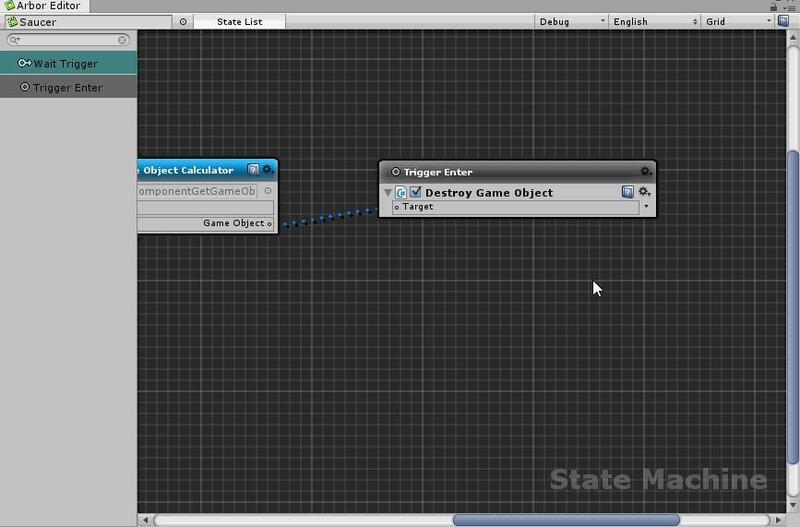 To receive from the GameObject slot of Component.GetGameObject, change the way to specify Target to Calculator. Please click “ Type selection icon” of Target property and select “Calculator”. 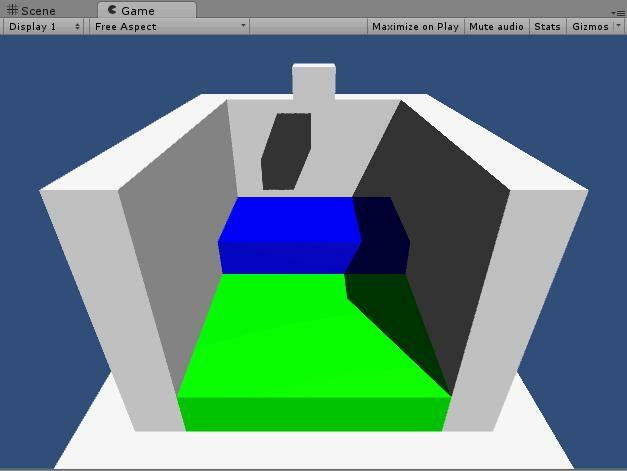 Connect from Target slot to GameObject slot of Component.GetGameObject. 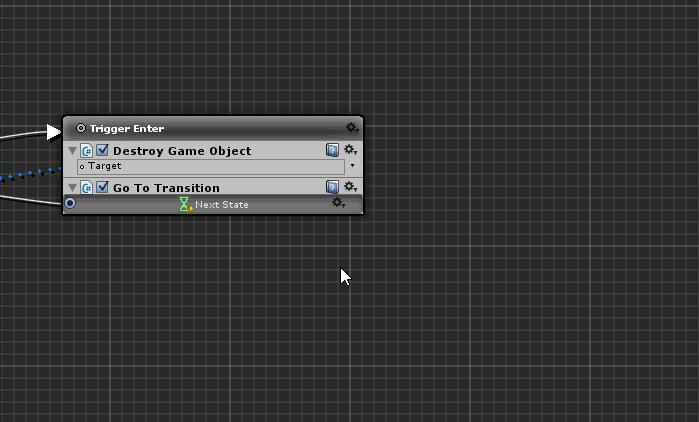 Add GoToTransition to transition from Trigger Enter state to Wait Trigger. 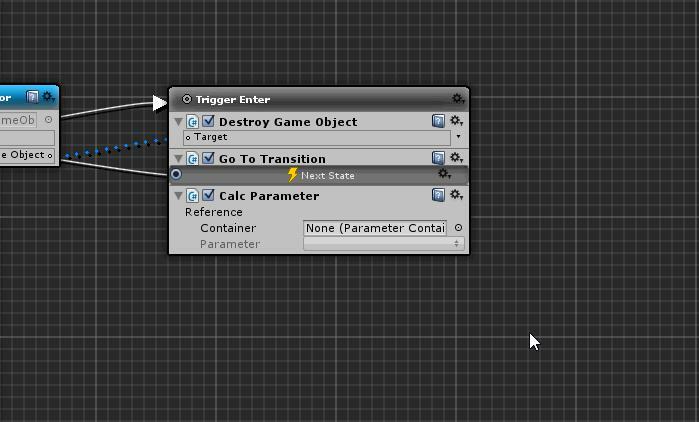 Add “Transition> GoToTransition” from Add Behaviour of Trigger Enter state. Make transition from OnTriggerEnterTransition in Wait Trigger state to Trigger Enter state. 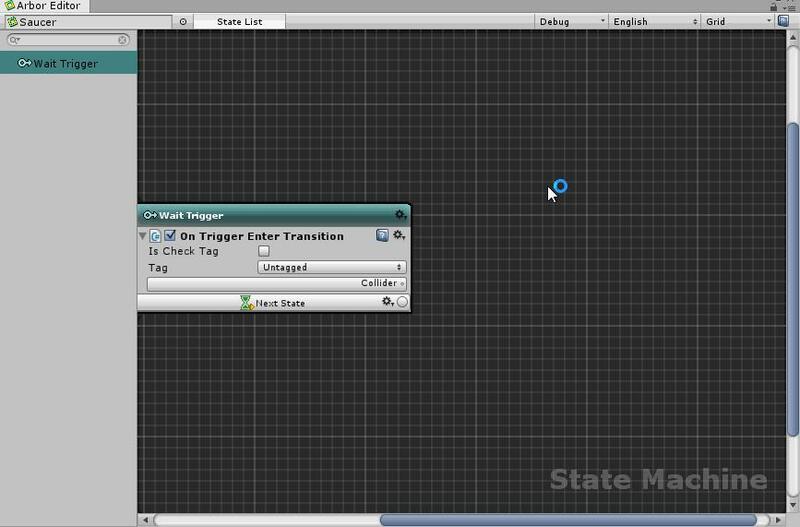 Likewise, the transition from GoToTransition in the Trigger Enter state to Wait Trigger state is made. Processing of TriggerEnter state is set to transition in Immediate mode because it wants to be done instantaneously each time OnTriggerEnter is called. For TransitionTiming, see “Manual : TransitionTiming”. Change Transition Timing to Immediate from the setting icon of Next State of OnTriggerEnterTransition. Likewise, GoToTransition will also be changed to Immediate to instantly return to the Wait Trigger state as soon as coins are deleted. First press “ Play button” to execute. 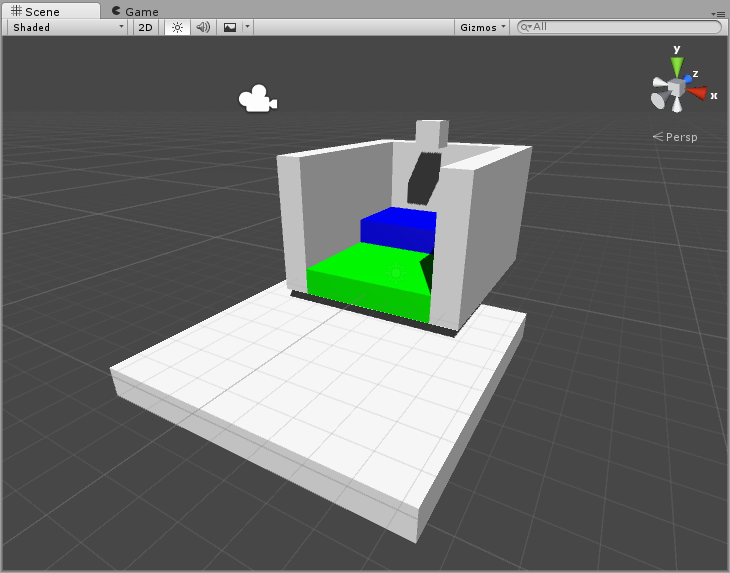 I want to confirm deleting the coin, so adjust the position of the Spawner object so that it falls directly to Saucer. Set the Z coordinate of the Spawner object to -3.5. Then, in the Game window, press the Space key and confirm that the removed coins are deleted the moment they touch the Saucer object. If it is difficult to understand that it was deleted, it is easy to see the Scene window. You can also use OnTriggerEnterDestroy if you just delete coins that touched the Saucer object. 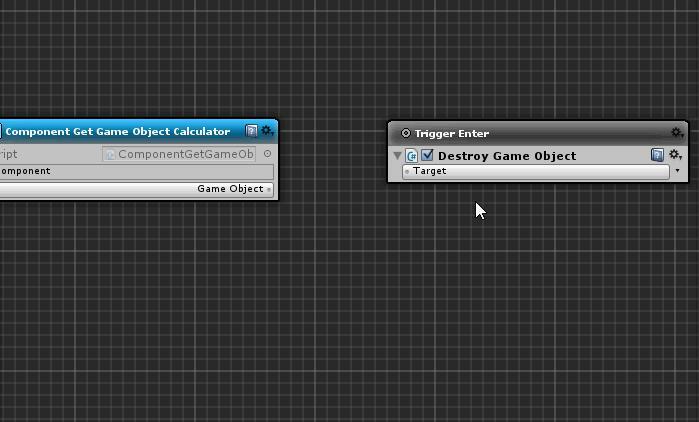 OnTriggerEnterDestroy is a behavior to delete the target game object. For more information on OnTriggerEnterDestroy, see Arbor Reference “OnTriggerEnterDestroy”. This time, I have introduced another method because I want to do other than deletion processing. Let’s add a score next. Create a Score parameter using ParameterContainer. ParameterContainer is a component for storing parameters used by ArborFSM. For details, see “About ParameterContainer” in the manual. 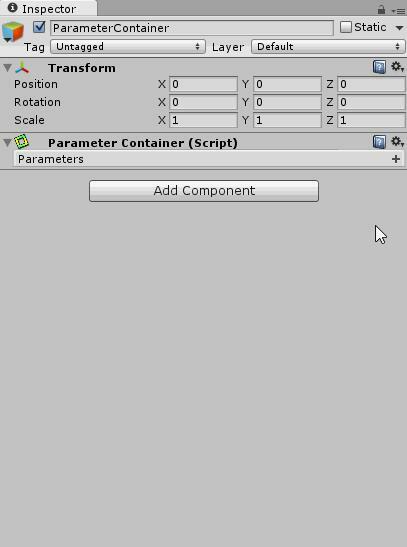 Let’s create an object with ParameterContainer by selecting “Arbor> ParameterContainer” from Hierarchy’s Create button. 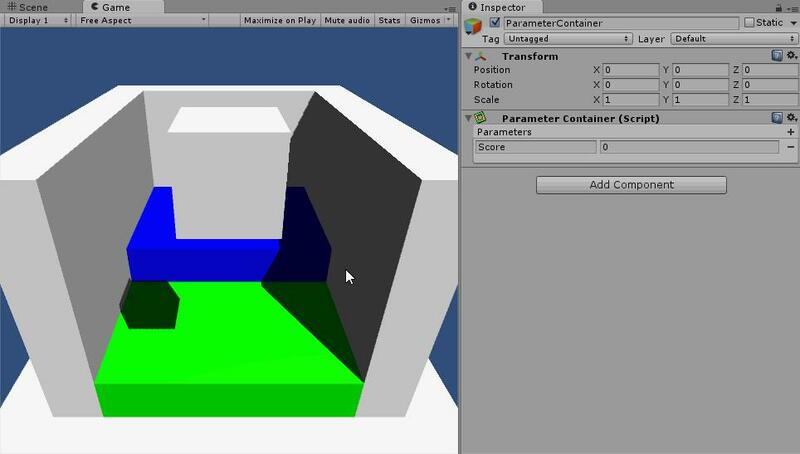 Add the Score parameter from the Inspector of the created ParameterContainer. Click the + button, select “Int”, and set the name of the created parameter to “Score”. If you do not open the state machine of Saucer with Arbor Editor, please open it from the Open Editor button. 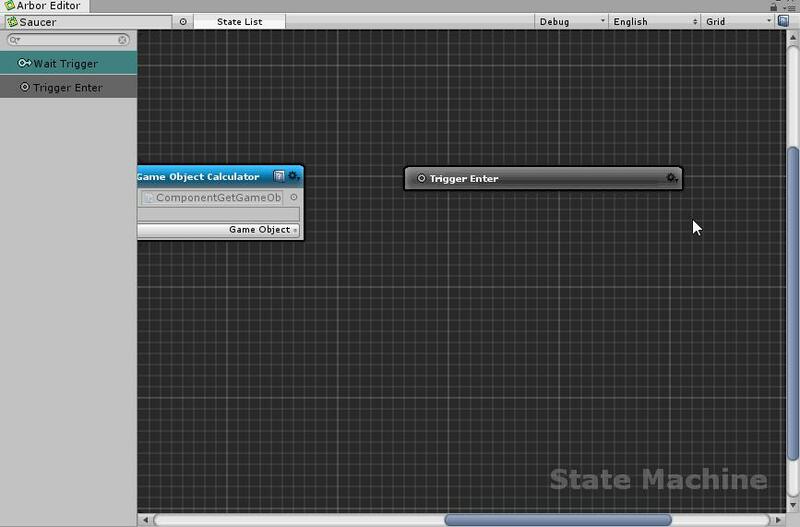 In the Saucer’s Trigger Enter state, add CalcParameter to increase the Score parameter. CalcParameter is the behavior to compute each parameter of ParameterContainer. For details, refer to the Arbor reference “CalcParameter”. Let’s add “Parameter> CalcParameter” from Add Behaviour in the Trigger Enter state. Since CalcParameter is at the bottom and after GoToTransition, the transition process takes precedence and CalcParameter will not be processed. Let’s change CalcParameter above GoToTransition. Drag and drop the title bar of CalcParameter onto GoToTransition. Set CalcParameter to increment the Score parameter by 1. Now you can set 1 to increase for Score parameter. First of all, press “ play button” to execute. In order to confirm that the score increases, adjust the position of the Spawner object so that the coin falls directly to Saucer. 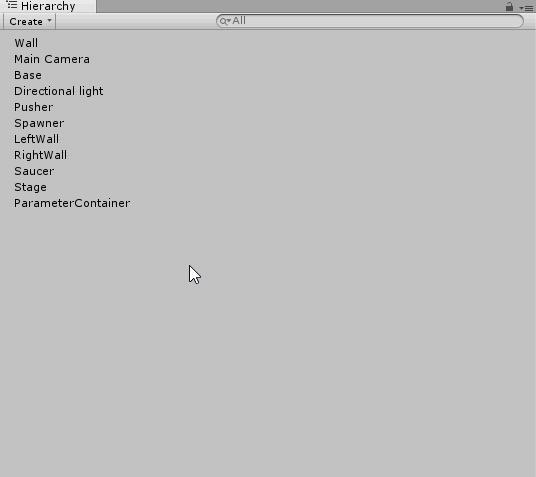 Then, select ParameterContainer object from Hierarchy and display Inspector. If you press the space key in the Game window and the coin disappears, you can see that the Score parameter is increasing at the same time. Let’s try to display the score in UI at the end. 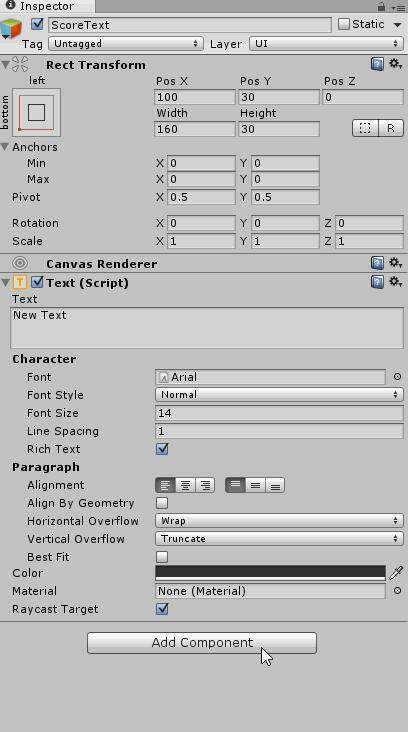 Select “UI> Text” from Hierarchy’s Create button to create it, and set the object name to ScoreText. Adjust the position of ScoreText to a visible position. 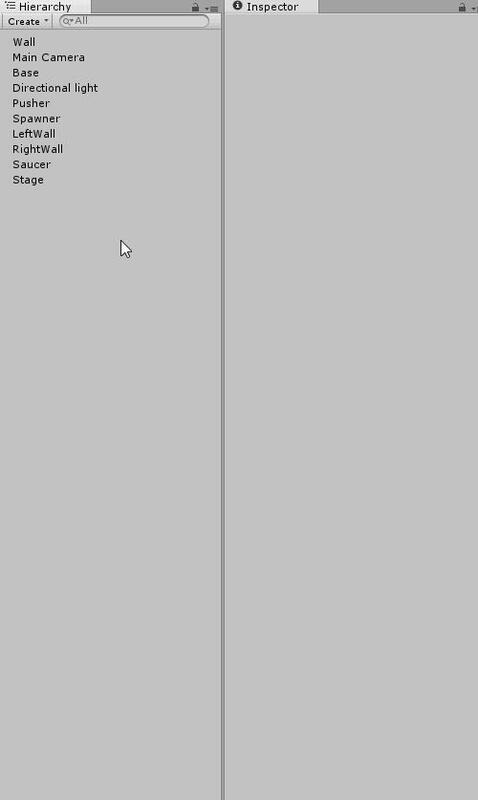 Add ArborFSM to the ScoreText object. From the Add Component button, select “Arbor> ArborFSM”. Then open the Arbor Editor by pressing the Open Editor button. To set the text, create a state named SetText. 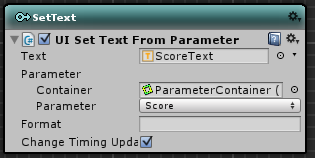 Use UISetTextFromParameter to set UIText from the Score parameter. For more information on UISetTextFromParameter, see Arbor reference “UISetTextFromParameter”. Let’s add ‘UI> UISetTextFromParameter’ from addition of Behavior of SetText state. We will set the UIText to update every time the Score parameter is changed. You can see that the ScoreText display changes each time the coin falls on the Saucer object by pressing the Space key in the Game window. Let’s check through all lastly whether it all works properly. Press “ Play button” to execute. Please check whether it is correctly pushed by Pusher object or falling to Saucer by pressing Space key in Game window. Coin Pusher is also included in the example of Arbor package. In this tutorial, I am not going to make a game clear judgment etc, but in the example version we are going to check once. The rough differences are as follows. Added to reduce the score every time you issue a coin from Spawner. This completes the “Let’s make a coin pusher”. Next time is “Let’s make an enemy of 2DSTG”. I will explain how to control enemy movement and weapon behavior with Arbor. By continuing to browse or by clicking “I Agree.” you agree to the storing of first- and third-party cookies on your device to enhance site navigation, analyze site usage, and assist in our marketing efforts.